Happy New Years to all our brides to be. Picture Love, Happiness, Laughter & Tears Of Joy & you picture Circle of Love Weddings this year! A magical year we will truly never forget. 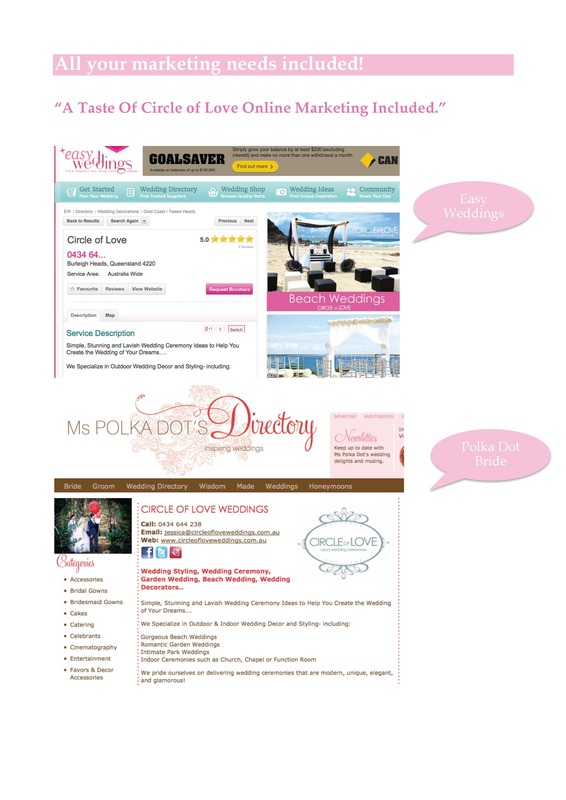 Interesting in having Circle of Love Weddings coordinate & style your beautiful wedding?? Whether it be for a beach wedding on the Sunshine Coast or Noosa, garden wedding in Brisbane, beach wedding on the Gold Coast or garden wedding, beach wedding in Kingscliff or Byron Bay wedding venue, Sydney wedding in the garden or beaches, Melbourne wedding or Perth beach wedding we would love to make your wedding dream come true. Want to see more of Circle of Love Weddings? 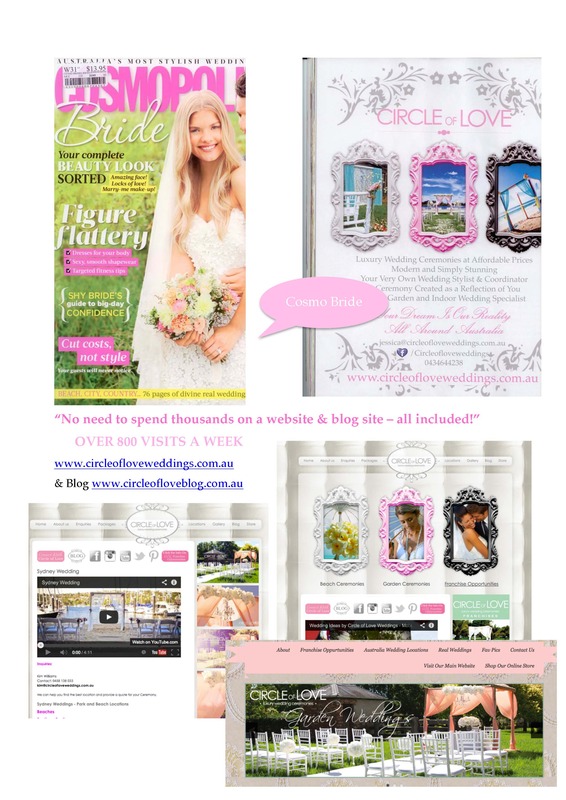 Do you have Google + then follow us for the latest wedding inspiration and Circle of Love weddings around Australia. This entry was posted in Our Weddings and tagged australia franchise, australia franchise oppurtunities, australia franchises, business for sale adelaide, business for sale brisbane, business for sale cairns, business for sale canberra, business for sale central coast, businesses for sale, businesses for sale brisbane, circle of love wedding franchise, circle of love weddings, sydney franchise for sale, wedding business for sale, wedding business for sale townsville, wedding planner course brisbane, wedding planning courses on January 6, 2014 by admin. Don’t see your region on here don’t worry give us a call or email & we can assess your area to see if its viable for a business in your region. 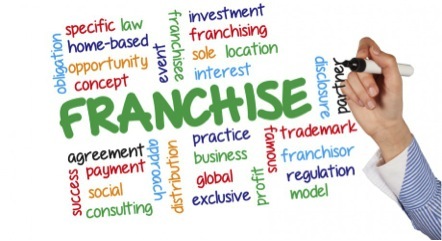 We just our franchisees to have the ultimate success. This entry was posted in Uncategorized and tagged australia franchise, australia franchise oppurtunities, business for sale, franchise for sale, franchise for sale adelaide, franchise for sale Albury, franchise for sale ballina, franchise for sale brisbane, franchise for sale cairns, franchise for sale canberra, franchise for sale central coast, franchise for sale coffs harbour, franchise for sale darwin, franchise for sale drawin, franchise for sale gold coast, franchise for sale hobart, franchise for sale hunter valley, franchise for sale ipswich, franchise for sale mackay, franchise for sale Mount Gambier, franchise for sale new castle, franchise for sale perth, franchise for sale port macquarie, franchise for sale sunshine coast, franchise for sale sydney, franchise for sale toowoomba, franchise for sale wagga wagga, franchise for sale Wollongong, wedding business, wedding business for sale on September 12, 2013 by admin. I know starting a NEW business from scratch can be quite scary at first…I know what it’s like to be cautious about jumping into a new venture with no experience..I’ve shared the same fears as you…I was once there to in the same position.. So here’s how I can help! ..Can you imagine..having me right by your side holding your hand every single step of the way through your exciting new journey? ..Can you imagine..What a relief it would be to just email or call me whenever you got stuck or were struggling with something?? ..Can you imagine.. The security you would feel knowing you had a professional at beckons call whenever you need advise? ..Can you imagine.. Never stressing about how to run a business &amp; what you need to do? ..Can you imagine.. Having business leads from day one? This entry was posted in Uncategorized and tagged australia franchise, australia franchises, business for sale adelaide, business for sale albury, business for sale Ballina, business for sale brisbane, business for sale cairns, business for sale canberra, business for sale central coast, business for sale coffs harbour, business for sale Geelong, business for sale gold coast, Business for sale Hobart, business for sale ipswich, business for sale mackay, business for sale melbourne, business for sale new castle, business for sale perth, business for sale port macquarie, business for sale sydney, business for sale toowoomba, business for sale wagga wagga, business for sale Wollongong, franchise for sale, wedding business for sale on September 12, 2013 by admin. Your Dream Job as a Wedding Planner ! ¬ 12 Critical Reasons why you should stop what you are doing now to learn these wealth secrets of professional Wedding Planning from– a company that walks the walk and has helped hundreds of other people just like you. Simple and Easy- to-Follow – All Wedding Decoration Supplies, Equipment, Resources, Training, and Templates will be provided to you! You will receive a comprehensive training manual in full colour that also includes a CD full of wedding decoration photos for use in capturing clients, full- event planning templates, invoice templates, marketing templates, and more!! This entry was posted in Uncategorized and tagged australia franchise, australia franchises, business for sale adelaide, business for sale albury, business for sale Ballina, business for sale brisbane, business for sale cairns, business for sale canberra, business for sale central coast, business for sale coffs harbour, business for sale Geelong, business for sale gold coast, Business for sale Hobart, business for sale ipswich, business for sale mackay, business for sale melbourne, business for sale new castle, business for sale perth, business for sale port macquarie, business for sale sydney, business for sale toowoomba, business for sale wagga wagga, business for sale Wollongong, franchise for sale, wedding business for sale on August 8, 2013 by admin.